Do you hear that happy roar? That’s the sound of excited genealogists who can now register for the Federation of Genealogical Societies 2019 Conference. This year’s national conference takes place August 21 – 24, at the Omni Shoreham hotel in Washington, DC and it is jam-packed with fresh, new experiences like pre-conference guided research opportunities, dynamic new session topics, hands-on workshops, an entire track devoted to society management and lots of networking chances at some incredible luncheons and dinners. When is the last time you received perks from a genealogy conference months before you even stepped foot at it? Six guided research trips are offered on Tuesday, August 20 to the Library of Congress, the National Archives and Records Administration (NARA) or the Daughters of the American Revolution (DAR) Library. For only $49 this opportunity includes pre-arrival webinars that you can watch at home, an online group meeting, transportation from the Omni Shoreham Hotel to your repository of choice, and three hours onsite research time. Registration for these are limited, so make sure to add it when you register for the conference. These 30-minute mini- sessions are new this year and they’ve been created to give you the basics on a relevant topic you may be interested in. They take place on Thursday through Saturday of the conference. Some of the sessions include: Baltimore’s Enslaved Catholics: Sacramental Registers, Recording Health in Family History Research and A Good Speaker is Hard to Find: Quality Programming on a Budget. There’s LOTS of new presentations at FGS 2019! There is literally something for everyone within these tracks to strengthen your research skills regardless of your level or area of expertise. America’s Resources, Mid-Atlantic Region, Women’s Studies, Colonial History & Settlement, and three separate tracks on DNA are just a few of the tracks to name. Check out the program schedule where you can see each day by track. Instead of setting aside one day designated as “society day” as we’ve done in past years, this 2019 conference will focus on societies throughout the entire week with a full Society Management track chock-full of sessions to benefit and strengthen your societies. The Focus on Societies Dinner and Annual Meeting on Wednesday, August 21 will include a complimentary dinner for society leaders as well as an opportunity to network with peers. Don’t worry, “Society Shout-Out” will be returning again to give members a chance to share all the exciting projects and activities your society has going on. Click here for more information and to register for dinner. We’re going back to the 1930’s and we’re bringing you with us! This special 1930’s themed event will include delicious food, dancing to a live traditional jazz band, and socializing dressed as one of your beloved 1900s-era ancestors. You’ll have an opportunity earlier in the week to create some 1930’s styled accessories in the exhibit hall to go with your attire…or just come as you are! This nostalgic evening will be a night to remember. Advance registration is required for this event, so don’t forget to add it during your conference registration. 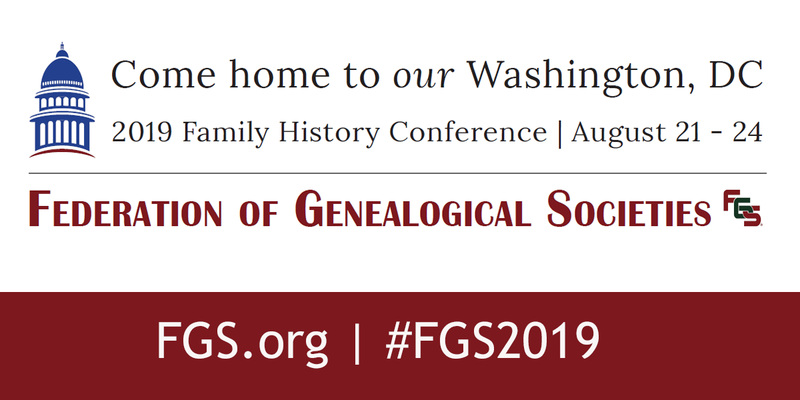 Come be a part of these exciting new things that will be happening at FGS 2019. We’ll see you in Washington, DC! Click here for the conference home page.